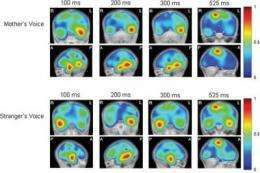 These images show an infant's brain activity upon hearing his mother’s voice, and then a stranger’s voice. We clearly see the activation of the left-side of the brain (responsible for language learning) in the first instance, and the right-side of the brain (voice recognition) in the second. Credit: Credit: doi:10.1093/cercor/bhq242, Cerebral Cortex, Oxford University Press. A mother's voice will preferentially activate the parts of the brain responsible for language learning, say researchers from the University of Montreal and the Sainte-Justine University Hospital Research Centre. 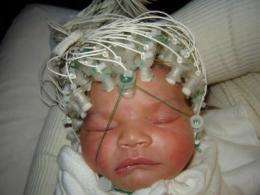 The research team made the discovery after performing electrical recordings on the infants within the 24 hours following their birth. The brain signals also revealed that while the infants did react to other women's voices, these sounds only activated the voice recognition parts of the brains. "This is exciting research that proves for the first time that the newborn's brain responds strongly to the mother's voice and shows, scientifically speaking, that the mother's voice is special to babies," said lead researcher Dr. Maryse Lassonde of the University of Montreal's Department of Psychology and the Sainte-Justine University Hospital Research Centre. Brain exploration had never before been undertaken on such young participants. "We applied electrodes to the heads of 16 babies while they were sleeping," Lassonde explained, "and we asked the mother to make the short 'A' vowel sound  like in the French word 'allô.' We then repeated the exercise with the female nurse who brought the baby to the lab. When the mother spoke, the scans very clearly show reactions in the left-hemisphere of the brain, and in particular the language processing and motor skills circuit. Conversely, when the stranger spoke, the right-hemisphere of the brain reacted. The right-hemisphere is associated with voice recognition." "Motherese"  the special voice mother's use to communicate with their babies  is scientifically recognized. The researchers took this into account by involving a nurse who is herself a mother, and they also countered the "novelty" aspect by arranging for the mother to meet with the nurse at regular intervals before the birth. Finally, speech analysis was used to ensure that the mother's voice and the voices of the other woman were sufficiently comparable. It was already well known that babies have some innate language capacities, but researchers are only just beginning to understand what these capacities are and how they work. For example, when a baby hears the "A" sound, he or she will make the mouth shapes needed to imitate this noise, even if he or she has never seen it spoken. "This research confirms that the mother is the primary initiator of language and suggests that there is a neurobiological link between prenatal language acquisition and motor skills involved in speech," Lassonde said. The research was published in Cerebral Cortex and received funding from Natural Sciences and Engineering Research Council of Canada, the Canada Foundation for Innovation, and the Canada Research Chairs programme. So.....all those months of non-stop cussing my fiancee did are........a good thing? I'll never hear the end of it!!!! What if the baby is born deaf?